Five years ago, I gave the commencement speech at the graduation for my master’s degree program. In front of an audience of 300+, I announced that I had struggled with debilitating anxiety attacks that made it hard for me to leave my house. It was a mix of terror and relief to have that dark secret revealed. The experience taught me a powerful lesson about life. When we open ourselves deeply to our greatest fears, it gives others permission to feel their fears too. As the ceremony ended and the audience trickled out, I had numerous people, most of whom I had never met, approach me with words of thanks and praise. One older woman said, “I’m glad you found your voice; it took me a lot longer honey.” Fellow colleagues told me they cried throughout as it reflected so heavily on their own experiences. A colleague’s husband asked me if I was a professional speaker. I laughed and responded, “Couldn’t you see that my whole body was shaking?” He hadn’t. He wasn’t seeing me; he was feeling me. As I spoke, my legs wobbling uncontrollably, my mouth dry, I too could feel the audience, their love and respect kept me upright. Right before I made my way to the stage, one of my colleagues leaned in and said, “You got this,” and that intention felt like a hand on my back keeping me steady. A week after graduation, I received an email from a man who wanted to further express his gratitude. He hoped my story would help his teen-aged niece who was also struggling with anxiety. The words of validation were overwhelmingly beautiful and empowering. 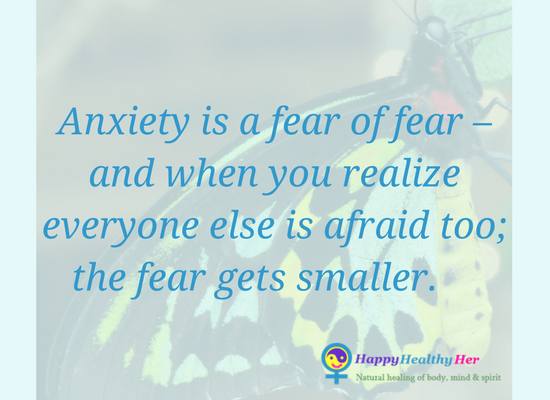 Anxiety is a fear of fear – and when you realize everyone else is afraid too; the fear gets smaller. What lingers in my spirit most from that day is not the words or the emails, it is the overwhelming feeling of acceptance. One man in particular stays with me. He was well dressed and likely in his 60s. My sense was that he was not the type to express his emotions, particularly not in a public way. As he passed me in the hall of the auditorium, his eyes locked on mine and he shook his head, a gentle smile crossing his face. It was the look my Dad gave me when he was proud of me. Yet, beyond the admiration was a deeper emotion, one that told me that as different as he seemed to be from me, we were the same. That is the beauty of being true to your darkest, most painful emotions; there is always going to be someone who feels them too. I would propose that there is nothing better in this world than feeling that connection, in recognizing that we are all one. We all experience the same emotions. Some of us reach depths of pain and fear that are so overwhelming and raw that we can no longer hide them. There in that vulnerable space we are most capable of feeling and being felt. I challenge you to go to that place. Be there with your pain and that of others; accept it; honor it; share it. Our honest emotions are some of the greatest gifts we can give to one another, and they are the surest way to let go of fear and receive true love. I never could have imagined the depths of pain and fear I would encounter in the years following that speech – multiple deaths, emergency surgery, divorce, moving, new jobs, new friends, dating! I continue to grow stronger, braver, and more filled with love as I open myself up to this terrifying and beautiful life. When we open up to fear, the most amazing thing happens, we let in the deepest love. Thank you to those who have been walking beside me with their hands on my back – I feel you always.